After I wrote about graffiti before I came across a Tweeter by the handle @missy_t_k who had caught some extra images of pictures she’d spotted. I found a couple more myself, and I think it’s worth putting them up here because no doubt they’ll be painted over eventually and it’s nice to preseve it in some form that others can see. I’ll start with the ones I’ve not seen myself. This is an unusual one compared to the others. I think this is a Star Wars based image showing a jawa. Interesting that it’s in white rather than black. I’m not sure this is by the same person as most of the rest, but it’s equally impressive. 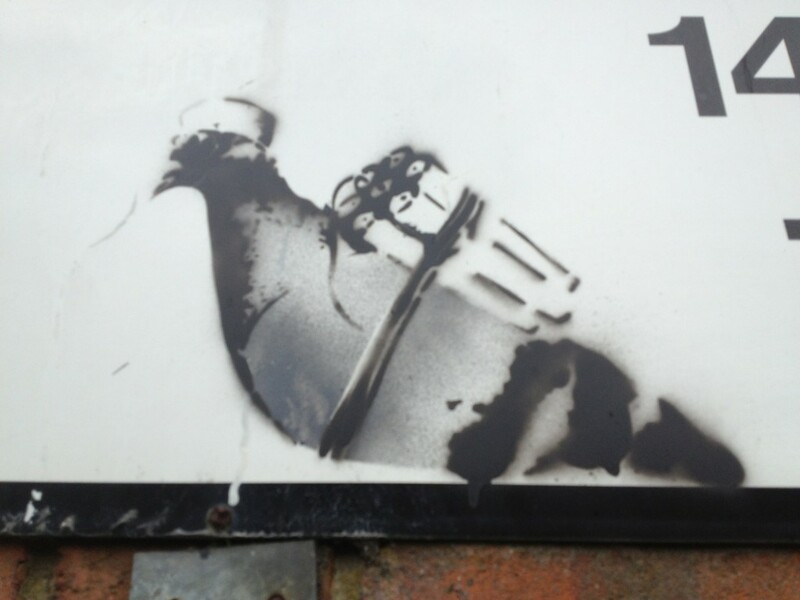 Next, there’s a “bomber pigeon” which is fairly self explanatory, although that looks to be dynamite, not bombs. Then, from under Crossway, is “We all have pain”. This was the first one I found on Twitter and missy_t_k alerted me to the rest after I commented on it. 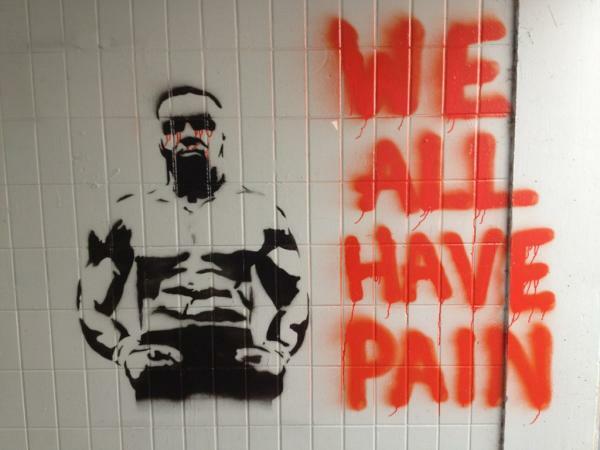 It shows a tough looking male, probably a boxer, possibly even some icon I’m unaware of, and a brash red slogan proclaims that “we all have pain”. The post is growing rather cluttered with all the images, so I’ll separate out the next few into another entry. 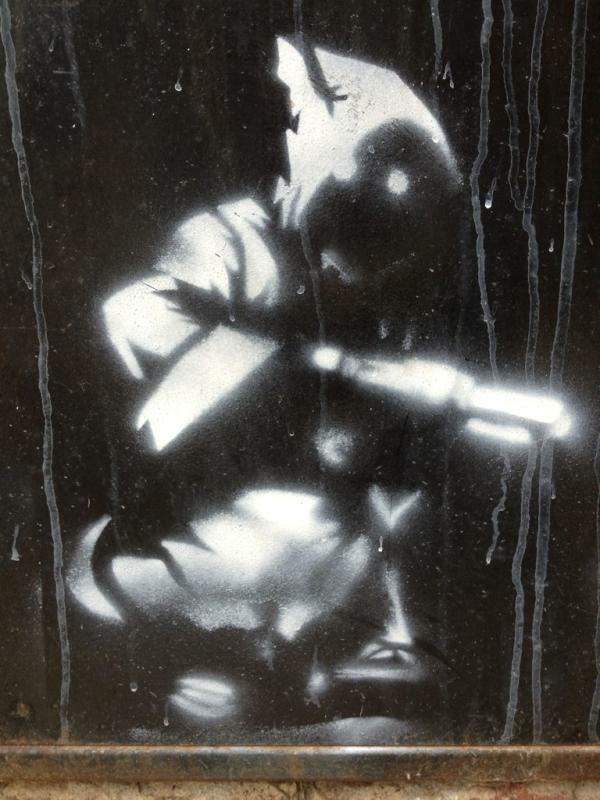 This entry was posted in about the area, oddities and tagged art, banksy, graffit. Bookmark the permalink.